where the entries spiral out from the center. Christian Krattenthaler, who is one of the greatest experts on determinants, tells the story of how he came across such determinants and how he went about discovering the formulas for such determinants. The preprint is available on arxiv. I have wanted to work with Christian ever since my Ph.D. days, when I tried to generalize a matrix inversion due to him. Finally, we have a joint paper. This also means that my Erdos number has come down from 4 to 3. 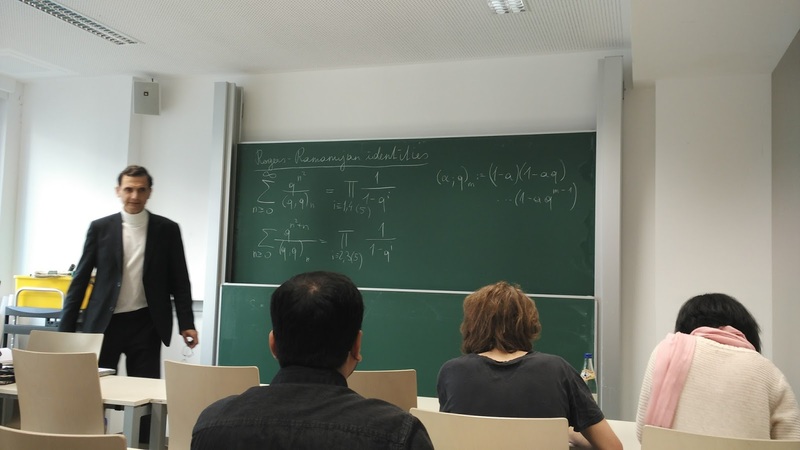 The picture above is from Christian's course on "Bijections" which I had an opportunity to attend in the University of Vienna during the period October 2016 to January 2017. Update: April 26, 2017 The paper has been accepted and will appear in Linear Algebra and its Applications. Here is a preprint on arxiv. G. Bhatnagar and C. Krattenthaler, Spiral Determinants, Linear Algebra Appl., 529 (2017) 374-390.